It was a pleasant, quiet morning when I strolled across tree-lined suburban avenues to pass through the gates of the Poor Clare Colettines convent snuggled inside granite walls on Simmonscourt Road. Memories of my childhood played in my mind as I remembered the beautiful smile of my Great Aunt beaming out at me – the young child nestled in beside his mother wondering why this kind lady could not go beyond the boundary of the bars between us. As I passed the corner before the entrance, I observed how the wall was adjacent to the often busy terrain of Simmonscourt Arena. In my mind I thought it further up the road, a little away from the frequent drama of conferences, matches, and events that create an abundance of worldly noise. But no, here was the home of the Poor Clare nuns snuggled into the area where regular business of the world unfolds. Those who chose to take the life of prayer to God, a choice of self-imposed exile from the world which is intertwined with the discipline of the Order, would do so with worldly activity close around them. This life may represent an unfathomable and unachievable road to many, but it’s one I would come to understand as unavoidable when talking to Sister Mary Brigid, the currently elected Abbess within St Damian’s. Sr Brigid entered the convent at 19 years of age in 1963. It was only afterwards I realised she had been in the Order for over 50 years. The first Poor Clares Order was created in the year 1212 by Clare of Assisi. The nuns of the Order abide by the vow of poverty and can only be supported by alms from the community. The monastery in Donnybrook was donated by the McCann family in the early 20th century, who had a daughter who entered the Order in 1898. People’s assumptions might lead to stereotypical conclusions about nuns, or about such a feat weighing down on the demeanour of such a person. Often portrayed in media as harsh or hilarious, nuns have been treated unsympathetically in the main. This became clear within seconds of my encounter of Sr Brigid. 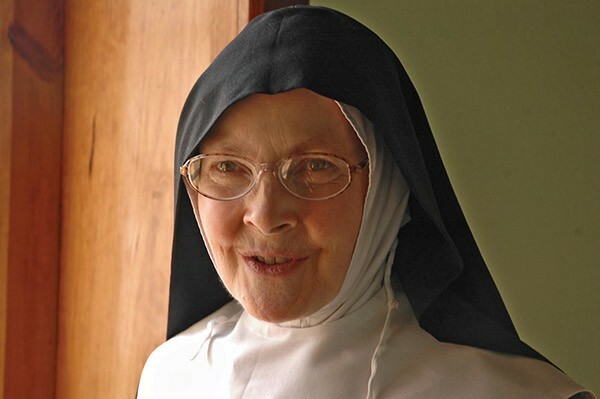 No melancholy about renunciation existed when I first met Sr Brigid. In fact I was struck by her serenity and peacefulness. I dare say that the life of prayer had led to something extra which was undefinable but profound. It was as if her love for the God she loved, cultivated in such concentration, was pouring out from her to all life. How could it not be when the service she gave was hours of prayer for others. It is not unlike the Buddhist practice of Metta Bhavana – the purposeful development of loving kindness for all life; or the mystical practices of uniting with God in Islamic Sufism or Hinduism. “I have found the life fulfilling,” she explained as she also expanded on matters of “God’s providence”, her decision to enter the life of true renunciation, and the amount of dedication to prayer on a daily basis; the latter an arduous and all-consuming dedication to prayer in between other duties, that can start from 5.30am and finish near 8pm, and may include an additional five nights per week of Nocturnal Adoration from midnight to 1am. Sr Brigid knew early in life that she was drawn to the life she now leads. She originates from a farming background near Tobercurry, Co. Sligo. She speaks of her father identifying her as the person to take on the duties of that life. However, her mind was drawn to the spiritual life and “the call” from God from an early age. “Dublin kept coming to mind even though I did not know of this convent specifically,” she reminisced. Eventually, someone gave her the specific information that led her to learn of St Damian’s in Simmonscourt Road. She told this in the context of how much the “outside world” has changed in terms of busyness and the amount of years a renunciate leading the monastic life might go without seeing the development of the outer world. Images courtesy of the Poor Clares. Nowadays, however, Sr Brigid has to leave the convent occasionally in her Abbess duties to see some Sisters who are in convalescence in Donnybrook hospital. The oldest nun residing in the convent now is Sr Kevin Gillick. She has recently celebrated her 100th birthday. The youngest nun is now in her sixties, which is a reflection of the modern view of such a life and the changing nature of faith in Ireland. When I left the convent I felt moved. Although I was able to stroll across tranquil streets, enjoying the pleasant atmosphere of mid-morning, the relative quiet in the heart of the city, and bask in the belief that freedom was mine, I also knew that Sr Brigid had obtained her freedom in what she does. Her abundant kindness and serenity was evidence of some release from all the mental disturbances we subject ourselves to in this world. It was hard to put into words but something significant had developed within her that was hugely generous, benevolent, and loving. It beamed out at me and I felt like it kept me company for some time afterwards. Yet the numbers of Poor Clare nuns in St Damians is now down to eight, even though a Southampton order amalgamated with them in 2008. There are a number of nuns in the convent with names pertaining to saints who influenced the development of the Poor Clare movement. “At the moment we have no ‘Clare’. It would be lovely to have a Clare,” Sr Brigid reflected on the next possible entrant with hope. Did I detect a little trepidation perhaps that there may not be such a candidate, or was I just reading it wrong? Perhaps it was a knowing glimmer or reserved assurance that someone would soon take the path to undertake their destiny as ‘Clare’ and complete the circle once again.